Overlooking one of South Maui's most beautiful beaches, Keawakapu Beach, Wailea Ekahi Village shines brightly in Wailea! 'Ekahi' means 'first' or 'one' in Hawaiian and Wailea Ekahi was the first condo village built in Wailea and is still one of the most sought after beachfront vacation rentals. Terraced grounds which seem to slope right down into the Pacific Ocean create amazing views for every condo resort visitor. 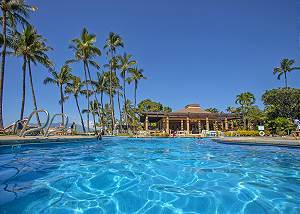 34 acres of fragrant and tropical landscaping greet you creating the perfect Hawaiiana atmosphere for you to relax on your best Hawaii vacation yet! After one vacation at Wailea Ekahi, it will be number one in your heart and the next time you visit, you'll feel like you're coming home. Here are some of the features that keep our guests coming back! Located centrally in South Maui, it's only a 5 minute drive to exciting nightlife, shopping, and dining in Kihei, as well as the upscale luxury shopping and resort dining of manicured Wailea. If you're looking to explore around Maui, Wailea Ekahi Village oceanfront resort is situated close to access points on the main roads for easy exploration! Besides the incredible island location, well thought out amenities have won the hearts of our visitors. Not one or two or three but FOUR sparkling pools to choose from on property! Paddle tennis and shuffleboard courts are also on the premises for you to practice your swing and engage in some fun games. If you can't wait to dine under the beautiful Hawaiian sky, look no further than Wailea Ekahi Village beachfront condo rentals. Tranquil outdoor dining is realized with barbecue areas available on property for your perfect grilling experience! 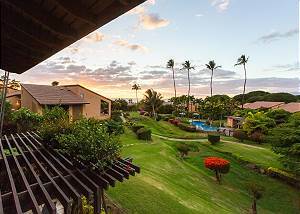 These Maui vacation condos for rent features studio, one, and two bedroom spacious suites in low-rise buildings spread out around the property. Although Wailea Ekahi Village is one of the oldest properties, condo units have been recently renovated and many of the suites have stunning modern remodels. Each unit has A/C to help you keep your vacation cool after a long day at the beach! With fully equipped kitchens, you are able to make the most out of your Maui vacation rental. Your PRIVATE lanai is the icing on the cake at this beautiful South Maui Oceanfront Resort. Entertain friends and family as you dine under the twinkling stars or toast to another beautiful Hawaiian sunset! Keawakapu beach is accessible by private entrance steps from your comfortable Maui oceanfront vacation rental. It doesn't get much better than this! With soft white sand, bright sunshine, and the lull of gentle waves, Keawakapu will surely be your Maui Beach hangout! Lay the day away, snorkel with Hawaiian marine life, or body surf, all right in front of your favorite beachfront Hawaiian getaway. Then come back to your home away from home, your cozy vacation unit! Cheers to the 'Ekahi' or future number one resort in your heart, Wailea Ekahi Village.